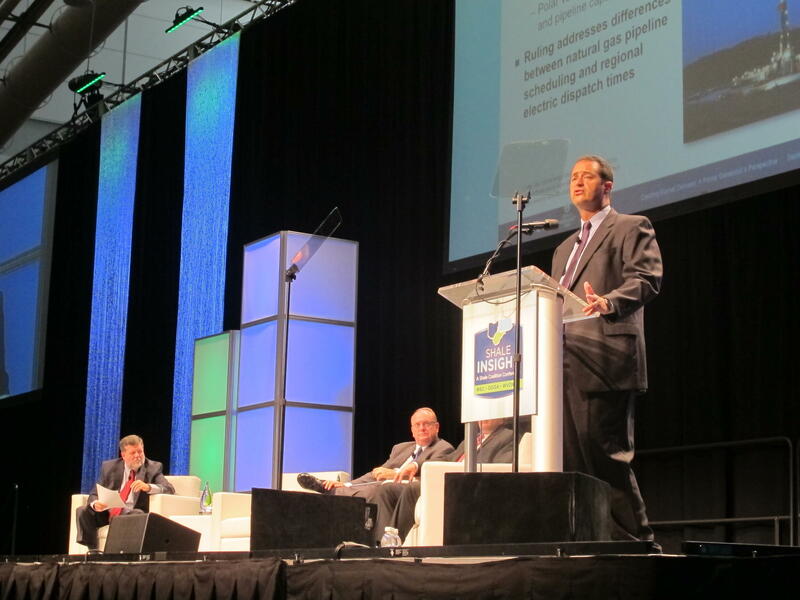 Donald Moul, senior vice president of fossil operations and environment for First Energy Corp speaks at the opening session of the 2016 Shale Insight conference Wednesday, Sept. 21, 2016, at the David L. Lawrence Convention Center. More than 1,300 energy industry representatives are in downtown Pittsburgh this week for the annual Shale Insight Conference that this year is focusing on getting the gas from the well to the user. Marcellus Shale Coalition President David Spigelmyer told a crowd gathered inside the David L. Lawrence Convention Center that the Pittsburgh region is lacking when it comes to pipelines and other infrastructure needed to get the gas to market. That drives up the cost to transport the gas and drives down the price paid to producers, he said. As of Wednesday morning, gas was only fetching $1.20 per million British Thermal Units (MMBtu) in Pennsylvania, but it costs $2.67 at the Henry Hub in Louisiana. “That erosion is a result of not having the infrastructure to gather that gas and get that gas to key consuming regions of Pennsylvania and of the broader market west, north, south and east,” Spigelmyer said. For the first time, Shale Insight conference officially includes the West Virginia Oil and Natural Gas Association and the Ohio Oil and Gas Association. Presidential candidates from both major parties were invited to speak at the event. Only Republican Donald Trump accepted. He will close the event Thursday. As the industry turns its attention to building infrastructure, detractors have done the same and are now working to stop construction through protests and legislation. Spigelmyer said government policies should not pick one energy source over another. The Pittsburgh Fraternal Order of Police endorsed Republican presidential candidate Donald Trump. That vote was part of the national organization’s choice to endorse Trump, announced Friday. Pittsburgh FOP President Robert Swartzwelder wouldn't say how many officers cast votes during the August meeting. He would only say the vote represented the 730 officers who pay dues. He said he hasn’t heard any pushback from officers who may disagree with the endorsement. Republican presidential candidate Donald Trump will speak Thursday at the annual Shale Insight conference at Pittsburgh's David L. Lawrence Convention Center, organizers said Monday. Conference officials told the Pittsburgh Tribune-Review that Democratic candidate Hillary Clinton was also invited but declined, citing a scheduling conflict.